rgg_20081130_124908-hdr, originally uploaded by rgordon. 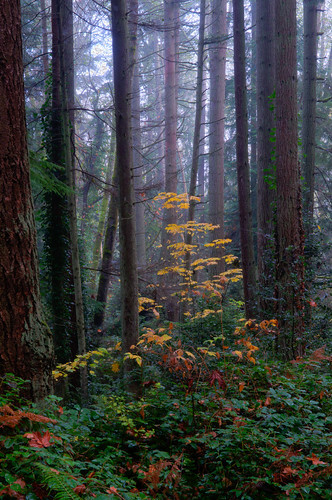 I've been experimenting with HDR photography lately, and one foggy morning I used it to attempt an image I had seen for awhile but had never quite captured - the autumn yellow of the big leaf maple in a conifer forest. This particular morning the fog was just starting to burn through the top of the forest, and gave me enough glow to work with.